Over the past two weeks, my children have only had three days of school, which means we’ve had A LOT of downtime at home. My son wanted nothing to do with the snow, and the girls lasted about five minutes before they were whimpering to come back inside. Art has always been a resting place for me, and now, as a mother of three, I am also benefitting from its ability to occupy my children! 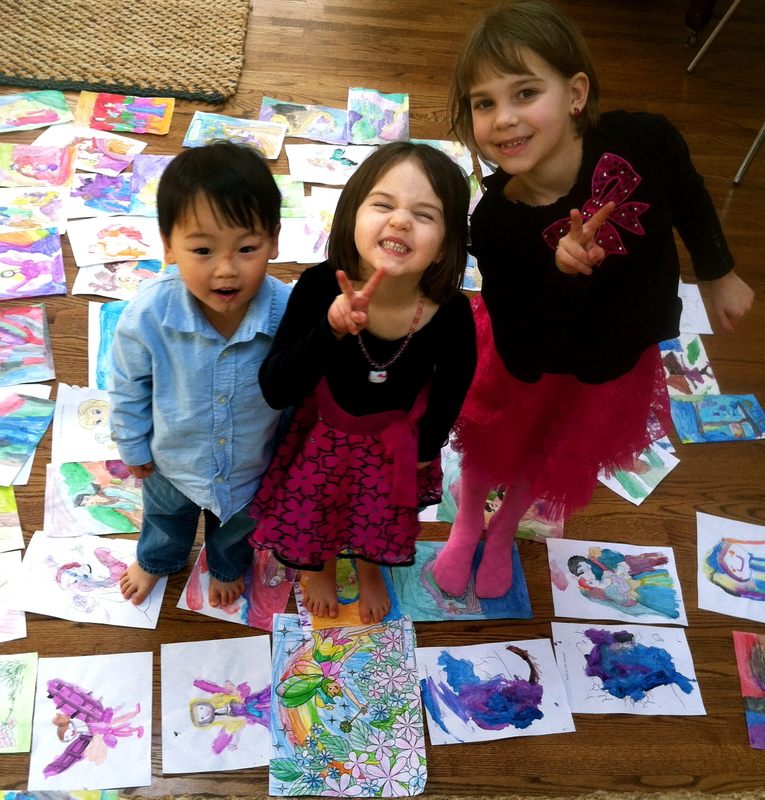 I am quite certain we would not have survived the past two weeks without new watercolors and crayons at our disposal. As a parent, it’s exciting to see your kids gravitate to the things you are passionate about. I love watching my children embrace their creativity. It fascinates me that at such a young age their artwork already reflects their unique personalities. 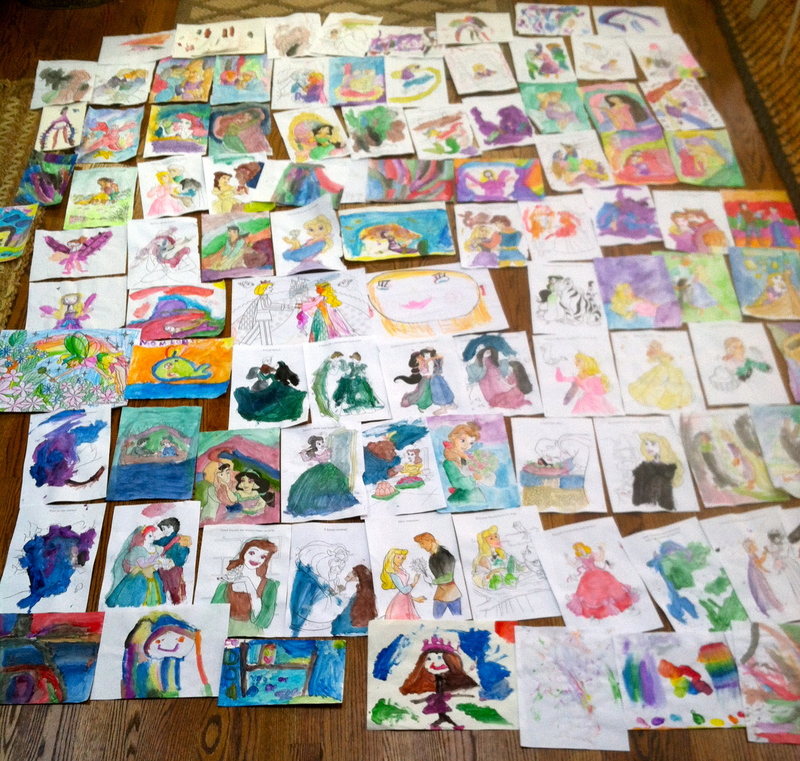 By the end of the week, I had massive stacks of kid-art crowding my desk, so I decided to spread them all out on the floor. Here’s an aerial view. That’s not even all of it! 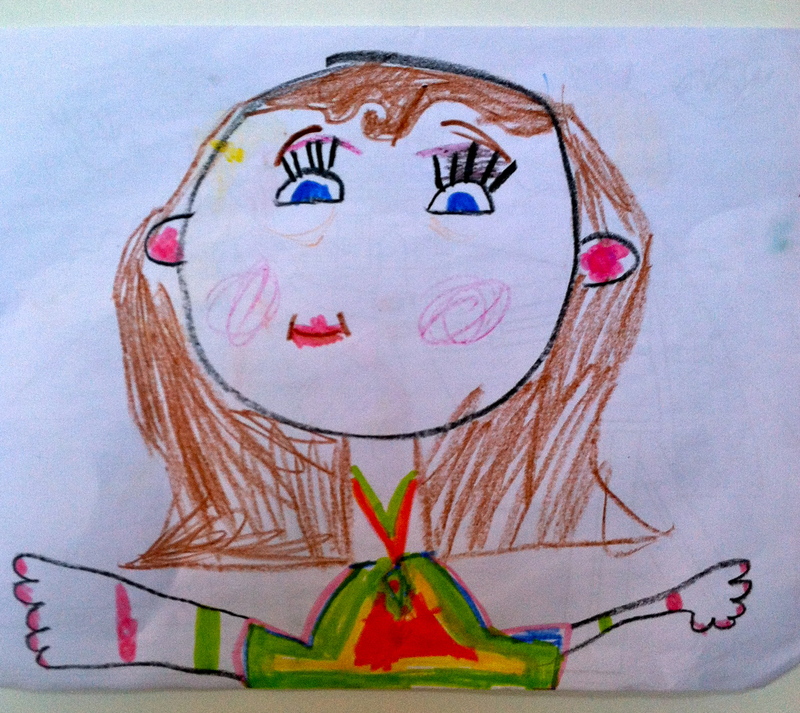 My oldest daughter is energetic, determined, and detail-oriented. She is a girly-girl who loves fashion and pretty things. She says she wants to be an artist when she grows up. 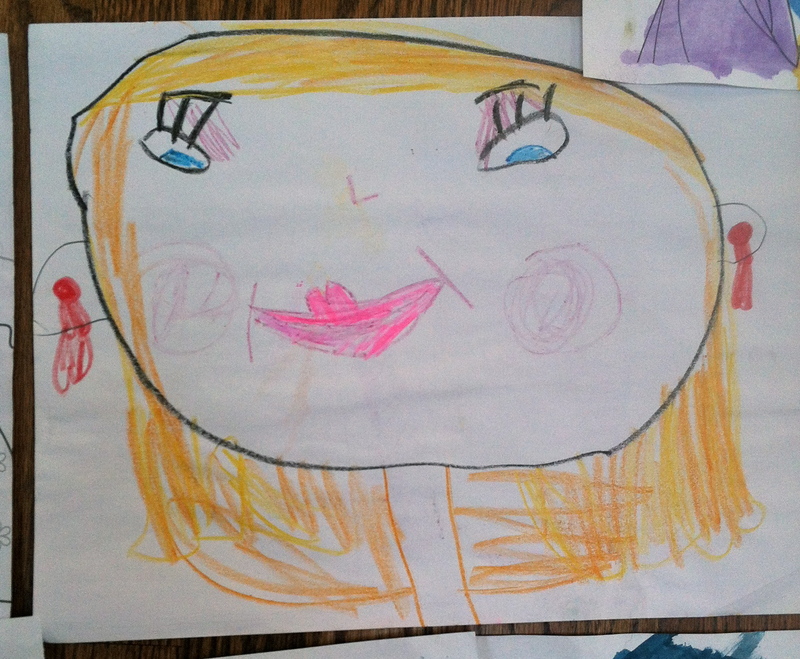 She drew a few self-portaits this past week…all lashes, lips, and earrings. 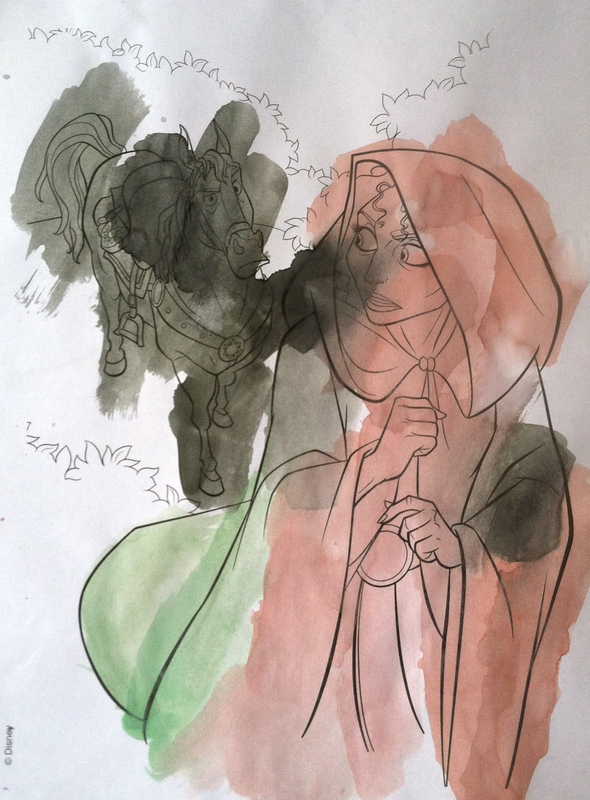 Perhaps this sounds a bit dramatic, but I feel humbled when I look at my children’s artwork. There is no pride, no inhibition, no self-consciousness. They follow their impulses and don’t second-guess themselves. They aren’t bound by perfectionism. As adults, I think that self-consciousness can make us or break us. It can drive us to improve our craft as we become aware of what works, what doesn’t, and why, but it can also paralyze us with fear. There is a certain beauty that comes from a child’s innocence. Their art is bold, raw, and unhindered. 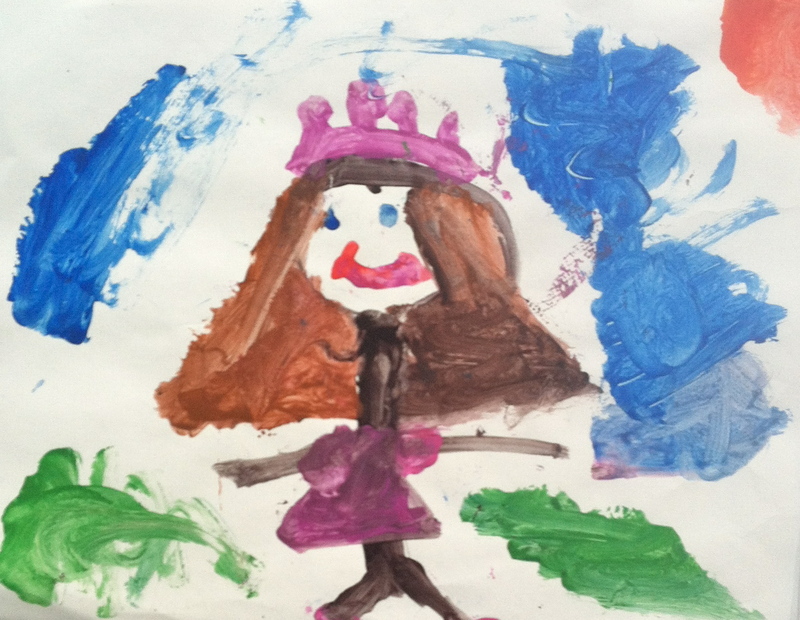 My second-born daughter is more of an abstract artist. She is also not a rule-follower by nature. 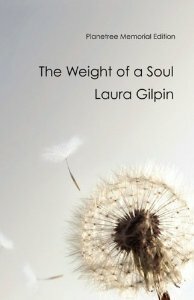 She is our free spirit who marches to the beat of her own drum, a quiet soul with an active (and unpredictable) inner life. I love how this quality shows up in her art work as well! 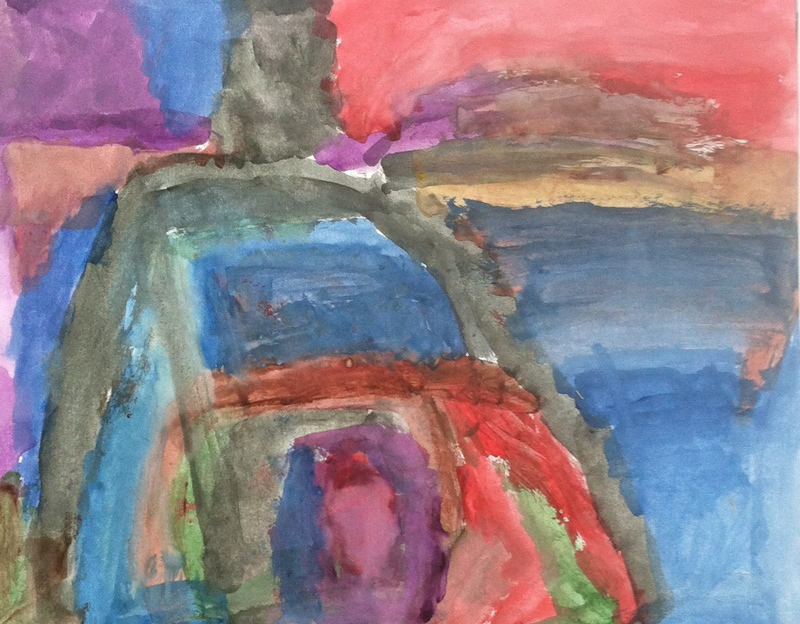 At the age of four, she is already exploring the relationship between shape and color and letting these things stand for themselves on the page. 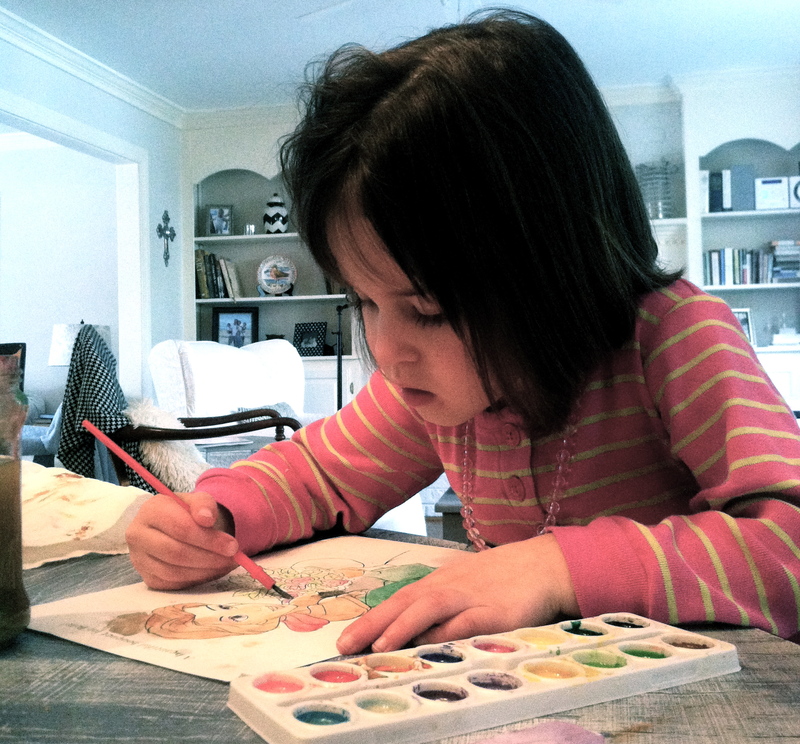 If you ask her “What are you painting?” she looks at you in disgust…as if to say, “If you don’t know, then I’m not going to waste my time telling you.” I love her sass and confidence. And…my boy…is all boy, with big strokes of brown and black, perhaps some green or blue mixed in, big blobs of color side by side. He is three and is still learning to rinse his brush between colors. He has meticulous hands, an eye for detail, and I look forward to see how this translates to his art work as he grows. The simplicity of a child, the way they exist in the world, without pretense or assumptions, is one of the greatest blessings of parenthood. 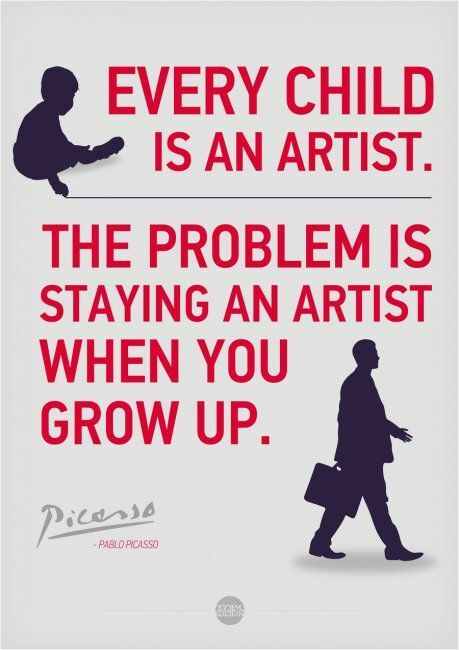 How have you “stayed an artist” as an adult? What, or who, inspires you in your creative work? I took a little departure from acrylics and fruit and decided to get a bit outside of my comfort zone for the new year. I’ve been captivated by winter skies over the past few weeks. Though light in the winter feels scarce, when it does shine, it shines with vivid angles and casts breathtaking colors through the trees and clouds. The blackbirds in our area are especially active, moving in dark swarms from yard to yard, collecting on telephone poles before scattering again. I captured the above scene at a stoplight on my way home from dropping the littles off at school yesterday. 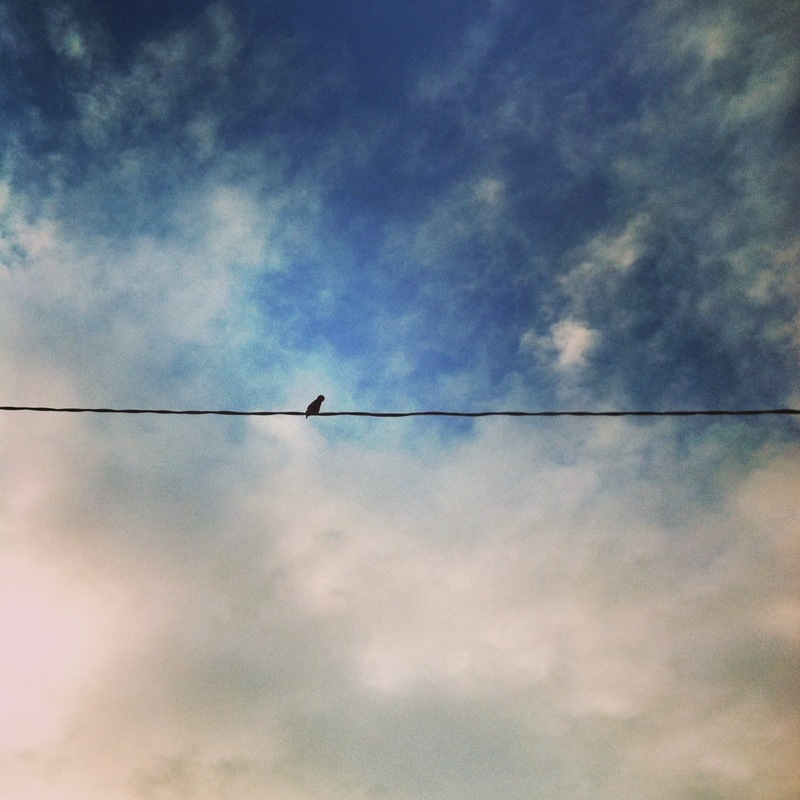 This little bird originally had company on this stretch of wire, but the rest of his crew flew off while it lingered behind, not seeming to mind a bit of solitude. In the aftermath of the holidays, I feel like I am starting to reclaim little pockets of it. Our normal routine has finally resumed and I’ve realized that I perhaps rely more on our routine than the children do. Without it, I fizzle out quite quickly. I feel like the little artist inside of me dies a rapid death when there is not space and silence to think and breathe. I had a pocket of time this afternoon to do some painting. 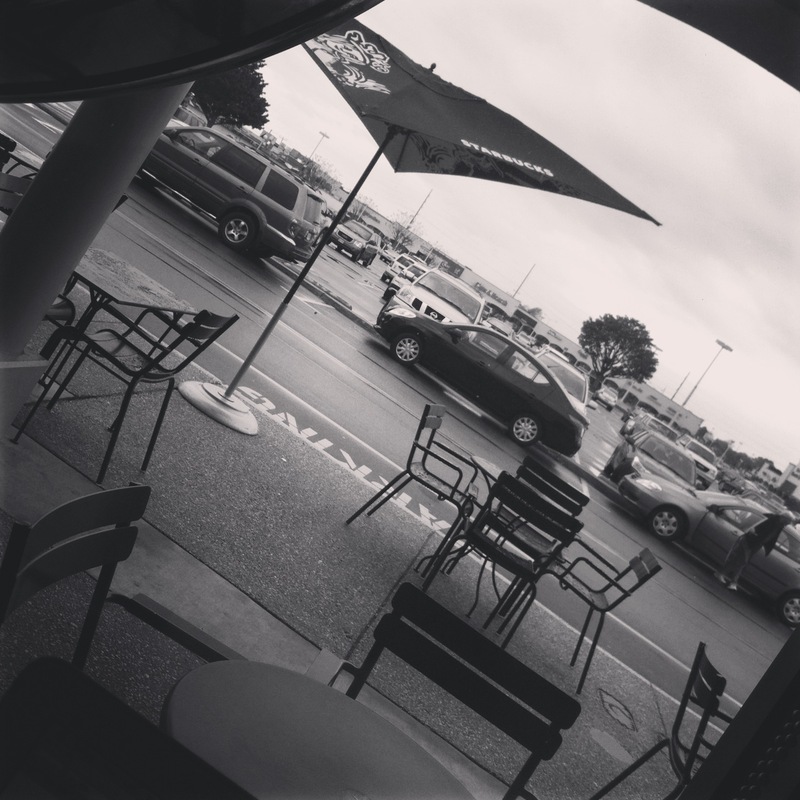 It was a quiet day, rainy but warm for this time of year, which was a welcomed break from the cold front that hit us last week. 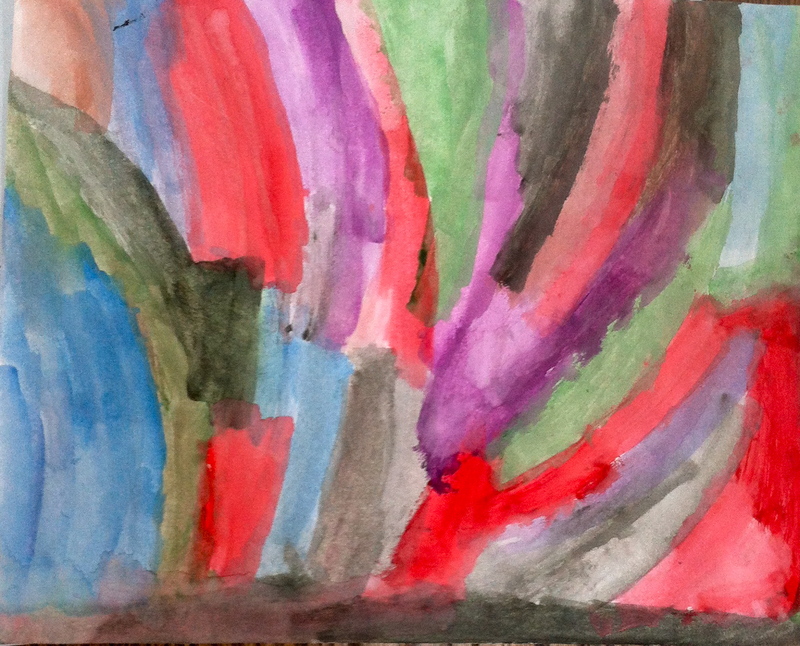 My old friend and extremely talented painter, Whitney Knapp, recommended that I try gouache paint a while ago. It is like watercolor, except more vibrant and opaque, like acrylic. I am still trying to get a feel for them, exploring how far they can be stretched. Today, I used them more like I would an acrylic, with less water and more paint. It was good practice. 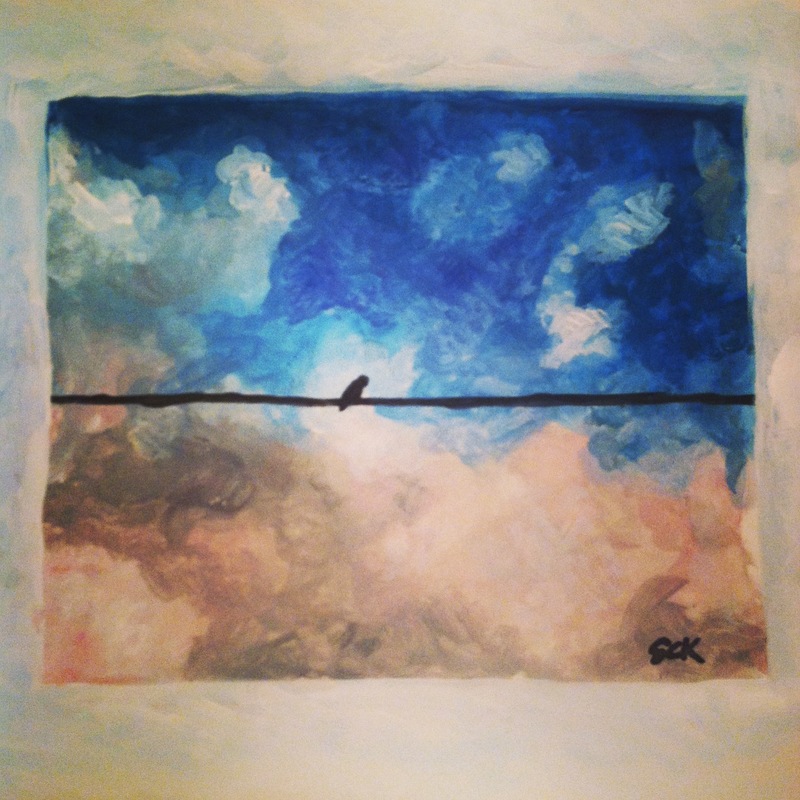 As far as the sky: I think one could dedicate the rest of one’s life studying and painting the sky. Fruit, for me, is a safer bet! As I attempted to paint this winter sky-scape, I was struck by the dramatic shifts in color that we don’t always notice, at least, not in detail. What a glorious work of art hangs above our heads each day! God, the Artist of all artists, always Inspiring! 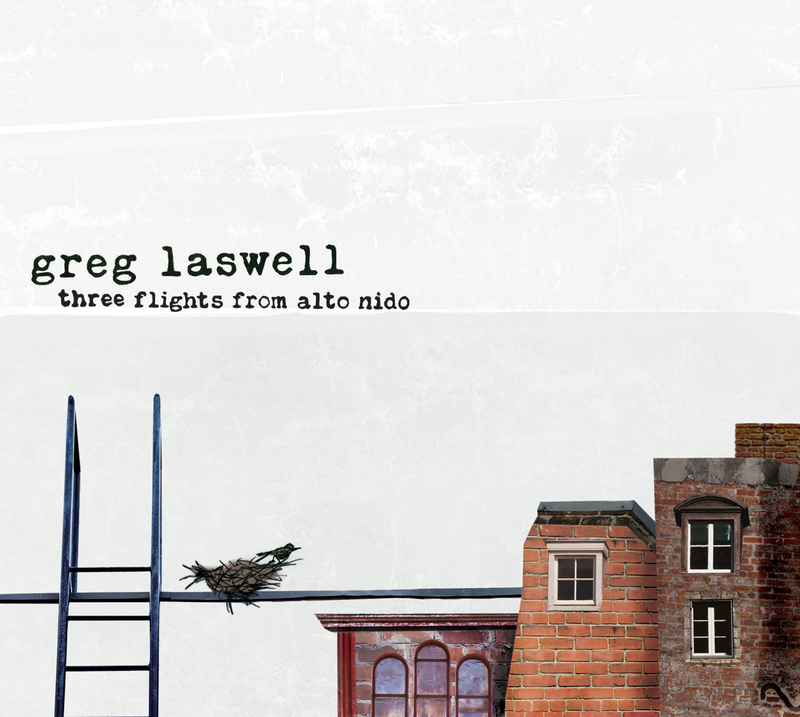 When I showed my gouache exercise to my husband, he said the first thing he thought of was the album cover from Greg Laswell’s album, “Three Flights from Alto Nido,” which just happens to be one of my favorite albums. (I’m sensing a theme here!) If you haven’t listened to it, I highly recommend it. What winter scenes inspire you? What new artistic mediums or ventures do you want to try in the new year? I hope you had a lovely holiday season! Here’s to more SOLITUDE…and space to CREATE…in 2014. I’ve been working on my MFA for an embarrassing amount of time. I started back in 2008. To my credit, there have been a few children, an adoption, and several moves wedged into this time frame, and I’m grateful that I’ve been able to work at my own pace. I am finally finished with my coursework and I’m slowly plugging away on my thesis, so the end is in sight, but somedays it still feels like I will never finish. I fear that I’m not a great finisher, especially when it comes to things of a creative nature, so I am determined to prove my inner voices wrong and just get this thing done. In the process, I am learning how to make my creative efforts a part of my life as reliably and unemotionally as any other task, whether it be feeding my children or taking out the trash. It’s easy to think that creative work is somehow superfluous to life, and therefore, should responsibly be dropped when life gets crazy. It’s taken me years to realize that my overall wellbeing is benefitted by regular times to let my creativity out. It doesn’t seem that our culture respects the fine arts in the way that it does, say, business or law or medicine, so I think that in-between the lines and starting at an early age, we learn that creativity is extra and elective. There is some truth to this, of course, and I realize that when one is in survival mode, creativity gets trumped by more immediate needs such as food and shelter. But when we are in a place where the needs on the bottom tiers of Maslow’s Triangle are getting met, I think it is wise to challenge the idea that creative efforts aren’t a true human need. They may not generate much monetary income, but in the economy of the human spirit, creative efforts are rich and rewarding. They speak to the soul. I hope to start unpacking some thoughts on the creative process in future posts, and I would love to hear what helps you in your own creative endeavors. I suppose it looks different for everyone depending on their brain chemistry and life circumstances. At this season of life, I don’t have all day to spend on my creative projects, so I am realizing that it’s important for me to “get in the zone” quickly. That way, I can utilize most of my time actually producing rather than staring blankly at the blank page. 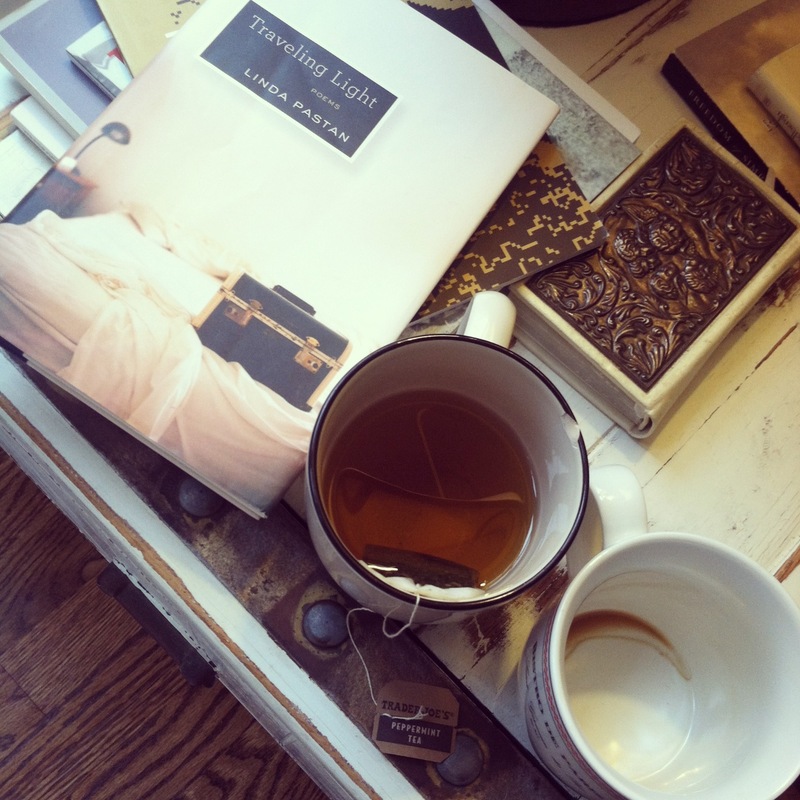 Being “in the zone” for me translates to coffee, music (something moody, melancholy, and soft), good sleep, my journal, and a stack of books. Sometimes I like to get out of the house and work at a coffee shop, but sometimes I like to work at home. As long as there are no screaming or whining children demanding attention, then I’m good to go! I usually have some sort of prompt to get my thoughts going, whether it’s a photo I’ve taken (images, in general, yield a wealth of ideas! ), a quote I read, a poem, etc. 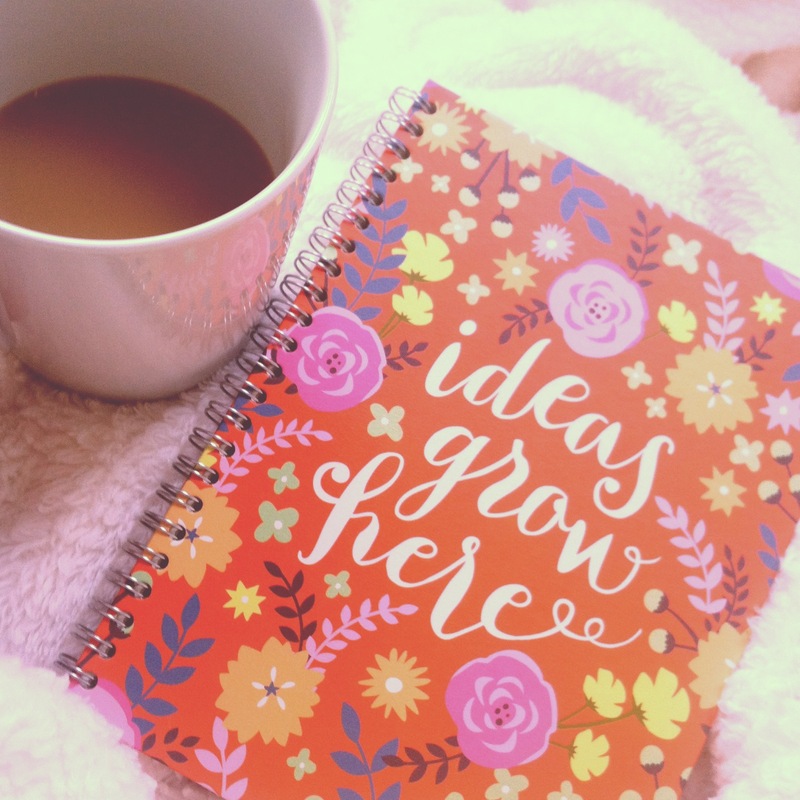 Holding onto all of these sources of inspiration has been helpful–being more intentional about storing these tidbits away for my next work session helps me plan how I want to spend my time. My journal is scattered with random, one-line musings that I hope to some day explore further. The more I engage with my creativity, the more I feel generating inside of me. The more I release it, the more it fills back up again. I am learning that the creative process is circular, not linear. There is no end. Everything is connected. I was talking with a friend of mine a few weeks ago. She is a writer but also has a day job, so she doesn’t always have a lot of time to spend on her own projects. She writes bi-weekly for an online publication, though, and she says that this habit helps to keep her creativity going. The articles she writes aren’t always what she would choose to write, but the act of sitting down and writing fills her creative bank nonetheless. 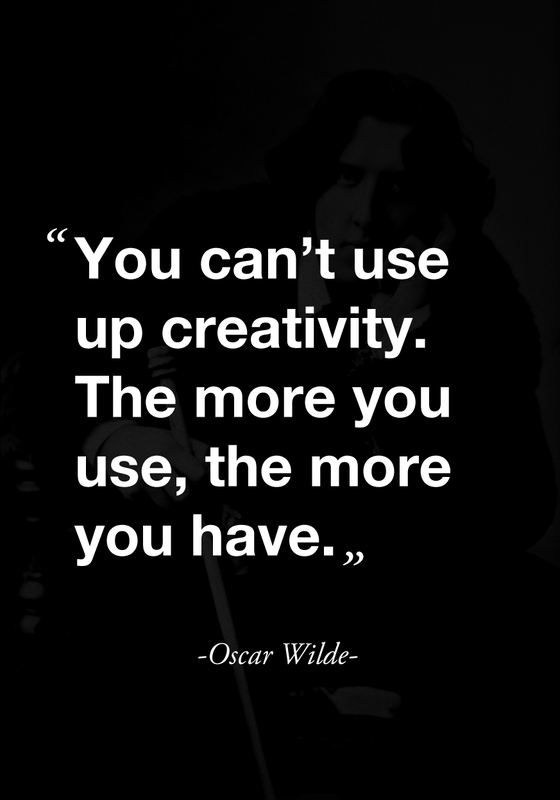 So, all of that said, what practices facilitate your own creative process? Do you have a process or a routine? What has helped you to progress and produce as an artist? Yesterday was the first day of summer, the longest day of the year, the shortest night. All the days of spring, so full of birth and growth, have climaxed and transitioned into a new season–summer–the season of light and fullness. What will this new season bring? Last night Ren and I went on a trip to Target, just the two of us. He lost his pacifier yesterday–it is the original pacifier we brought home from China. He held onto it for almost a year before it finally disappeared. We got him a brand new paci last night and he seemed unfazed by the change. He embraced his new green one wholeheartedly. He continues to settle in. He continues to surprise me. I also bought a brand new journal during our Target trip. I opened it up this morning as I drank my coffee. Staring at that first blank page always makes me feel as though the possibilities in life are endless. What will happen in the days to come? What will be written in its pages? What poems will be conceived, what thoughts explored, what experiences captured, what stories told? 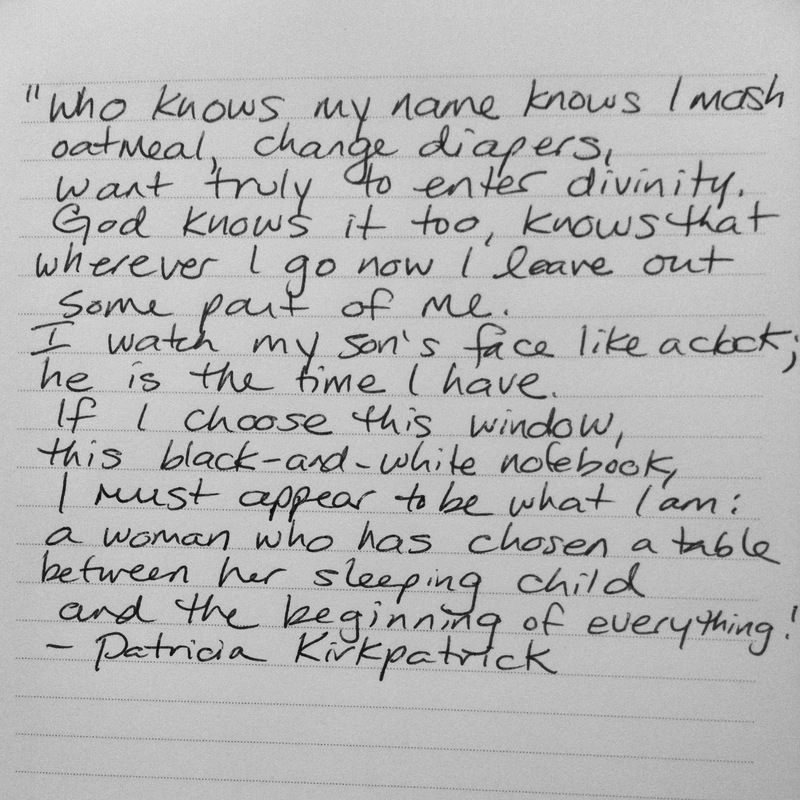 This all reminds me of one of my favorite poems, “At The Cafe” by Patricia Kirkpatrick. and the beginning of everything.